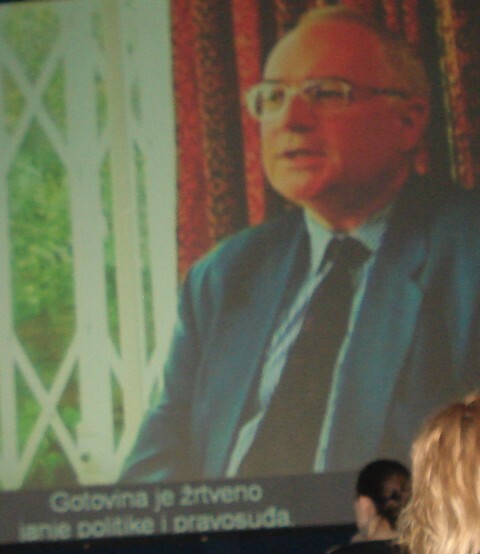 Professor Slobodan Lang kindly gave an interview for the readers of the CROWN on 25 April 2011. The interview was conducted at his home in Croatia's capital Zagreb by Darko Žubrinić. Operation "Storm" is the first ever military action that prevented genocide. It prevented genocide in the region of Bihać in the western part Bosnia, where there were at that time about 150,000 thousand people, and where I expected that if the case of Srebrenica happened again, there would have been about at least 12,000 people killed. For that reason I gave specifically asked president Tuđman to take military action. And now I will take a background. I am Jewish, I come from a Holocaust family. All of my family has been killed during the Holocaust, and I do detest genocide. And I asked genocide that be prevented. So, when this conflict started, I wanted to use the suffering of what happened into the European Jews to prevent the genocide as much as I could in that war. It started in Dubrovnik in 1991. Together also I worked at that time with Bernard Couchner, present Minister of Foreign Affairs, and I asked him: "We should protect a right to a home, not to take people away". And I told him that Holocaust began in 1933, not in 1942, [i.e.] when people lost their homes, not when they were taken to concentration camps. It went on this concept in 1992 when the war in Bosnia started, and they faced all of the issuis in Bosnia. First, at that time we observed that in the region where "Oluja" ("Storm") happened, the most western part where major world religions historically meet - Orthodox, Catholic and Moslem. As a frictions of continents, this was a friction of major faiths, place where we have to find peace; and how we have to work together in the 20th century, we had one more friction. In 1992, as a beginning of the war, out of 300,000 people who lived there, 100,000 were Croatians. They left, they were chased out. I don't like the term "ethnic cleansing". Nothing is clean, because it is dirty. So it is chasing of people, chasing them out. Germany did not become "cleaner" when it chased Jews out. So, that happened in 1992. In 1993 we looked for the way how through so called White Way in a peaceful way to enter Central Bosnia. It brought peace in the conflict between Croats and Moslems, and then had the largest ever humanitarian joint enterprise between Moslems and Christian. The biggest throughout history! I went to the United States, to the Center of Health and Human Rights of Jonathan Mann, and we organized the first conference on the prevention of genocide. Also, I talked to Newsday. In Newsday I published an interview called "The most profitable business - genocide." And I asked Helen Fein, distinguished genocide scholar, not to speak only about the crimes from history, but to start prevention of genocide. She spoke in The Musum of Holocaust that these words were the beginning of the concept of the prevention of genocide. Newsday asked me to write a book, but I had no time to stay in the United States and write books. I had to go to the real people, in real life, and to prevent future genocide. From that position I went from one place to another and did what I could. In 1994 I founded "Refugees from Croatia", in so called "Blockade", that we used 150,000 people altogether, supporting of those Croatians that were chased, to block UN forces in Krajina now, and to ask "We want to go home. Let us (go) home". That is the largest peace action that happened in Europe since the Second World War. If the UN were capable to comprehend what it means, and they let them go home, there would have never been operation "Storm", because the issue would have been solved peacefuly. But it did not happen. At the beginning of 1995, in spring, there was a summet of heads of states in Kopenhagen. I spoke there about the most tragic Europeans, and I was afraid what will happen in the UN protected areas. But there was no understanding. They could not comprehend. Actually, (for) the heads of states there was not ability to give a meaning to basic decisions in a war at that time. Immediately after that there was very tragic killing of a large number of young people and children in Tuzla. I went to Tuzla, and I used there, as I did elsewhere, so called "rapid knowledge". And this my talk is rapid knowledge how to get understanding about something which has happened, and about which you who - listen to this - you have to have understanding. Because you are responsible, not to be on this side or that side, but to get knowledge needed, so that you can take decision. That you can take position that tomorrow you will not be afraid of, that you will be able to tell you own children, however far away, that you knew what position to take. So, I went to Tuzla, and asked them, and I have a book that they have written about what happened to their children, as if though those children lived. I said I will not permit them this genocide to happen, this mass killing, even if on paper. But these young will live. And every family wrote on avarage how long they would live, what they wanted to accomplish, what was their vision, I think even if they are dead. They will have hopes, they will have vision, they will have their dreams, their world will exist. And it was given (i.e. published) with the support of Hans Kishnik, and at that time also Mayor Bešlagić of Tuzla. After this happened, ... but - a fascinating thing... I wanted to be very fast, so to bring it to United Nations. But these parents, people who loved those children, they wanted to make a nicer book. So it could not be in time for Srebrenica. But when Srebrenica happened... T that time Bihać was in danger from two sides: these forces of United Nations, in three years being there, they were not able to bring people back, but they actually alowed people being killed in the territory who remained, and they were alowed Bihać to be attacked from both sides - from this UN held territory, and from the so called "Serbian Republic" in Bosnia and Herzegovina. And on the 9th July (1995) Mladić entered Srebrenica, and afterwards killed 8,000 people there, which the special UN court, but the regular UN court, defined as genocide. More than that, in the case of Serbia it was found guilty of not preventing genocide, and it is the first state ever mentioned. And it defined responsibility of states to prevent genocide. It is a shame that there was not immediate summet called "On the responsibility of all heads of states to prevent genocide". If there is one joint body of heads of states, it should exist. It's a body to prevent genocide, a council to prevent genocide. But even secretary general of United Nations used to have advisor on the prevention of genocide, but he no longer has it. Because they had not sufficient honor to say: "There is knowledge, there is experience." There is no powerful enough will to prevent genocide. And United Nations, which has no will to prevent genocide, is not United Nations. And we don't need it, because it has no vision, and it has not respecting Universal declaration of human rights, and The general convention on the prevention of genocide. After that, I went,we failed, they would not let us enter into Bihać in a peaceful way with convoys for Bihać, and I was that scared, and as a doctor I knew that prevention failed. I divide medically with cancer. Cancer is destruction, it destroys organism. But when we do operation like mastectomy, it's using of a force. We don't like using mastectomy. Every mastectomy is a failor of prevention. But, it saves lives, it is an operation for saving life. So I said to president Tuđman: "President Tuđman, I don't know how to prevent genocide in this case further on. I have no further knowledge of nonviolent means." And that's why the operation Storm was ordered. And it (nonviolent means) broke down. It's a strictly good Samaritan. It has nothing to do with liberation. It is exclusively humanitarian. Why so? Because in order to liberate, we would have had to take all the risks that come aside with breaking of the military force. We would surround a territory, we wouldn't alow Serbs to come out, they would stay there. We would prevent all the crimes that went further on, we would prevent looting. But the time was - shall we prevent genocide or not. We have seen the case of Rownda. We have seen Srebrenica where international community not only that it did not prevent it, but it did not pass, it did not analyze why it failed in prevention of genocide. We must go years back, when Jews pleaded with British: "Bomb the Auschwitz! Bomb the Auschwitz! These people will lose their lives, but stop what is going on!" They didn't. So, we did this intervention, we saved the people in genocide. I went the first day there, and I spoke on the television and I have a material on it, and I said to the people there, when they started to ask me, I said "Dear women of Bihać, Bišćanke and Bišćani, I congratulate! You are the first people in human history that won over genocide. You are the victors against genocide. And my deepest respect for that!" But immediately I went to the camps where the other issues came. What can we do now with the side effects when the operation is on, how do you care. So I went how to protect first the patients in the hospital in Knin, so that nothing would happen comparative to what happened in Vukovar hospital, when Croatian soldiers and others were killed. So I protected all of them. You never heared a word about it. I went to the camps where the Serbs are, and who are people who were there in the UN camp, and I pleaded with them, and I told them: "This is your country! You have a right to your home. Don't go anywhere! Don't listen to going anywhere because they will misuse you in your home, then they will take you away of your home. And then you will never have a new home. So, stay here!" So, after this work Serbs were at the camp and I asked them to stay here for their home, the second issue was to go to stop the Serbs that were leaving. Because to tell you the truth, I wouldn't have allowed them to leave [PDF]. But such a concept in international law doesn't exist, because the existing laws are based on the pre-Holocaust tragedy of Jews in Europe, when they have been chased out of Germany, and the world was ashamed because they did't let them in. Then we have a post-Second-World-War of Germans being thrown out, and the Cold War. So the concept was that you have to take refugees in, not that the people had the right to stay at their home. And I transformed it there. And they were against existing rules to the right of home. So I went to stop the Serbs. But as I went there along the way, I came across the Moslems who split into two groups, from this history. One was on the one side, and another was on the another, and 25,000 of them left. But I came among the Moslems. Now you listen to this. Who do you think is more valuable: a Christian or a Moslem, a Serb or a Bošnjak? I had to face one or another. If I had the possibility to face the Serbs, I would have rather lost my life than let them go. But I came among Bošnjaks and they used that I cannot treat Moslems as lower and I did not let them go. They remained in Kuplensko in their camp I stoped them, and at that time Humanitarian comissionar for health Emma Bonino from the Radical party of Italy, asked to come let them go, because there are rules in Europe. I said: "No! They are going home. You can take me to court, but I will establish the right of people to home." I took them later on to their home. I took two men who both lost their hands, and I asked them and said: "You didn't know how to shake hands when you had them. Now shake with what remains." And a poem has been written about how these two parts these two (shook hands). And there has been peace. That the first ever peace being made in entire European history. The return of the people is unknown until what happened there. But the other Serbs left, including the American ambassador Peter Galbright, because of the entire violence, he went to give them security and they were taken out. That's a mistake. I would have a rule, at least now, not to let them out. But then I had a further issue what came, what will be with the remaining. And 10,000 primarily older people stayed. And I launched together with the International Federation of the Red Cross and the Committee of the Red Cros operation "Save Life" [PDF]. I went through 600 (six hundred) villages, hamlets, houses, asking "Is there anybody here?" And we found that more than 10,000 people were saved in such a manner. I called this entire condition "social collaps." It should be understood, that when war ends, there is social collaps, like it happened in Berlin in Germany with a tragic consequences of what happened with a civil population. A social collaps has not been adequatly defined. The Red Cross and humanitarian responsibility at a time of social collaps has not been defined. Immediately we published a book on "Save Life", and we published a paper about it in the British Medical Journal. Q. At that time you have been advisor of president Tuđman. A. At that time I was advisor. Q. In fact it was with his support that you could organize such a huge humanitarian operation. A. Yeah, I asked him... But I thought that he is responsible. I wrote, all of those documents exist. They have been all written. You know, I come ... I have a very specific history... My grandfather was ... I come from probably the oldest Jewish family here. He was in the leadership of the Jews of Old Yugoslavia before the Second World War. He is to a much extent of the hero I am the one who tried in a way to use all this experience of this tragedy. Not to be left, not to know what to do. Not to face the issue as Hana Arendt would describe of this disorganization and tragedy. I wanted to show what is the power of this tragic experience. Experience that Europe never used! How to plan, what to do? What it can lear from it? I did use. I gave life back to the tragedy of these millions of people who lost their lives, and it was used. And not only, but including the operation "Storm". For this reason I expected this knowledge to be used. But you must know that Europe and Righteous among the nations became highly respected when Israel recognized non-Jews who saved lives of the Jews. But good people did not save only Jews. The fact is that Europe does not know how to recognize goodness. Europe does not know how to remember, how to have experience of doing so. It did not say "Thank you". Europe knew through this tragic, its own history of imperialism, just to recognize what is evil! Just to see who should be (punished). And it did it again. So it created a Court, where it didn't alow aggression to be treated as a crime. There is no meaning of anything else as a crime if aggression which initiates it didn't alow it. Further on, it did not alow witnesses who know what happened to speak. This Court never heared me speaking! It is too strongly afraid of its own shameful history. And that's why it will be a Court of shame! There will be nothing that will be remembered of it, because it did not start from anything. And that's why it is a failure. In this particular case, what I am urging now, and what I plead for now, is "Permit knowledge! Don't behave like a Court afraid of truth!" So I am urgently calling to have a conference of knowledge. Anybody who knows, from any side, from anywhere in the world, about the operation "Storm" - use science, come and let's have the speaking of witnesses. Let's have the speaking of experts, let's have the people of responsibility. Not as secretly speaking, not as hiding what they said, but of putting together the entire experience and knowledge. Permit the knowledge about the operation "Storm" to save lives throughout the world. Any place, anwhere, and at any time. Don't hide it! Don't have respect for the risks of the future! This Court said that we don't care about the future! We don't care about goodness! We don't care about preventing of genocide! And I protest. And ask you - give people the right to breathe. Get people right to be freed. Permit people not to be afraid. Free them for that and that's what is possible and should be done. Q. Do you remember how many medical experts collaborated with you in those critical months? A. There was not only medical! It was humanitarian. The number of those ... they are practically all alive, from including very important international figures. For doing my work first I received the American flag as a sign of respect. I am the only one who did it, before our prime minister, but he received it formaly... And I received the highest honour of the European Union for humanitarian work, for my work during the operation "Storm", for saving people from all sides. I am a person who risked my life, and protected for saving lives of Croats, Serbs, Bošnjaks, Jews, Albanians. I even say when somebody asks me what is my nationality, I say "I am Croat, Bošnjak, Jewish, and Serbian", because if I saved lives of those people, then I have to say "That's what I am!". My face is the face of Abraham, because I believe if need be for a good to sacrifice the life of my closest ones. I am willing to quarrel with God in order to get in the community to get people together for what is needed to save. I am conscious that so many people around don't know that genocide can be prevented. And I hope to begin the faith, so that one day we can say, "From this place new people developed. New knowledge developed. It developed that genocide can be prevented. And can be prevented at any time, at any place in the world. And that's the place where the genocide was stopped." Q. And it is also important that you were not the only individual who was working on this. You were motivating thousands of people. A. Thousands of people participated in many actions we talked about. I had a special privilege through faith and knowledge that events in which I participated, using faith and knowledge - they became extremely more bigger than myself. Thousands and thousands of people... But they can become even stronger through knowledge and through the concept of truth beyond the events at that moment. But it was a need to be passed to other parts of the world, to be used by other thousands and millions, to be a message for the future, to be a knowledge of future. I was, as you say, as experimenting with particular treatment or doing, the knowledge is here, the knowledge is here. The knowledge does exist. It was developed through enormous suffering of thousands and thousands of people, of people who took care. It is they who did it. But it has been stopped. But I as you asked, as Giordano Bruno said that the Earth is round, permit the knowledge of the prevention of genocide to be known! Don't allow inquisition of this Court that forbids the knowledge of goodness! In 1991, Dubrovnik was beseiged, but we refused to surrender and mobilized people to have dignity, courage, mutual support, creativity and hope. French Academician D'Ormesson, came and said this is the place where new Europe is being created. At that time there was a need for strategic improvement in defense – I called it „The Challenge of goodness“. It worked. Europe had no sufficient vision and solidarity to keep peace, stop agression or prevent genocide in the Balkans. For the third time in a century it was not capable for true humanism. Neither totalitarian, nor consumerist Europe can succeed. We need true humanism, living on our work, with solidarity among people and countries, respecting all people. People are more important and truly powerfull than technology, money and armies. Without sustainable humanism, Europe has no chance. Challenge of goodness is still on! Learn from Dubrovnik. Robin Harris, London: Gotovina is a scapegoat of the politics and judiciary. Mr. Harris is distinguished scholar, known in Croatia for his excellent book Dubrovnik: A History.